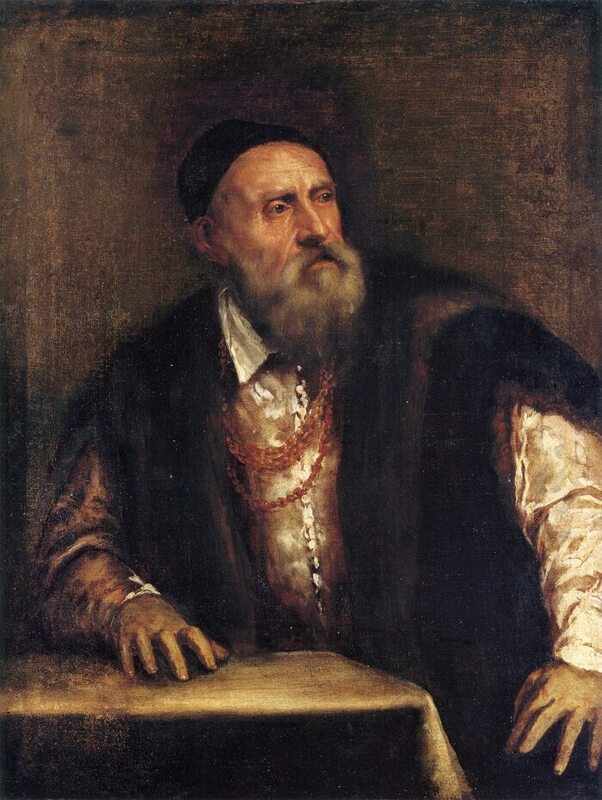 In this assertive image Titian, approaching seventy, presents himself as still vigorous, his rapacious hands still powerful. Whereas in other self-portraits he depicted himself holding the instruments of his art, in the Berlin picture his own bulk and alertness convey the meaning; the golden chain, privileged insignia of the knighthood conferred by Charles V, serves as the single outward sign of status. The table before the sitter, modifying the parapet motifs of Titian's earlier portraits, functions as a stabilizing base for the heavy yet dynamic contrapposto of the figure. Within the massive silhouette, the eyes and hands bespeak a special vitality. The major source of the portrait's energy, however, is surely the product of those hands, the painting itself. The brushwork in the hands not only defines but is, in fact, identical with their very structure, while the brilliance of the shirt and chain animates the entire field. The painting is usually considered incomplete, yet a remarkable degree of finish is achieved in the rendering of the artist's face and right hand, articulated to the fingernails. Over the bolus ground the paint is applied in varied consistency, from light scumble with a dry brush to thick impasto, and from this combination of hard-edged stroke and softer toning derives the sense of clearly defined substance and structure. While it is conceivable, even likely, that the canvas might have been awaiting further work, in its present state it offers full testimony to the master's technique and art of painting. Despite the absence of a paintbrush, this self-portrait is, as it must be, a tribute to that art.